If you're a regular reader of this blog or have seen me speak, then you already know that I'm a big fan of SEMRush. That said, if you've read my posts about finding profitable keywords, then you've probably also noticed that I have a paid subscription to the SpyFu keyword tool as well. Now, there's a lot of overlap between these tools, but there is a reason I have a subscription to both. Below I'll dive into SpyFu specifically and cover what it is, what it does, how you can use it to improve your online marketing campaigns and give some information on SpyFu vs. SEMRush (and why I have paid subscriptions to both). First up, I'll be up front in saying SpyFu leaves some to be desired usability wise, IMHO. The data is awesome. The UI (user interface)? Not so much. Also, a note from Captain Obvious – affiliate links are used in this post. That said, let's get going. A lot of the information listed there is arbitrary. Also keep in mind that the social metrics listed are not the number of “Facebook fans” etc., but are rather how many social shares that individual page (in this case, the homepage) has received all by itself. As with all competitive keyword research tools, try to think of the data more in a relative perspective than an absolute one. Meaning that the data that a site gets 10,000 visitors per day is likely off – but the relativity of one domain to another and the trends are usually pretty decently on point. Underneath that main table, you'll find a listing of the top organic and paid keywords SpyFu believes is driving traffic to the domain. Again, try to think of the numbers shown relatively. IME, the ratio is often pretty accurate, even though the absolute numbers aren't (with ANY competitive keyword research tool). So, while “bass pro” may not drive 164K clicks a month as an absolute accurate number, that keyword being one of their top referring keywords is likely correct. Next, you'll see a listing of the most profitable ads and keywords from a PPC perspective if the domain is running a paid search campaign. You'll see the estimated daily clicks a keyword is providing the domain you're researching (more on how I use this awesomesauce under the “show me the potential” section in this post), the estimated CPC and the ad history for the ads that are being run on those keywords. This is followed by a listing of who SpyFu believes to be the top competitors for a domain segmented by organic competitors and paid competitors. And last but not least, you'll see a listing of which pages SpyFu believes is sending the domain the most search traffic – complete with the social share count of each page (side note – this is an awesome way to see the social shares for an individual post – by putting a specific post URL in to research – when the page itself doesn't have any visible social buttons). Next to it you'll see a listing of subdomains SpyFu has found on the domain. At the top of the main dash is a tab that will take you directly to the detailed information for the organic keyword, paid keyword and ad history sections. But you'll also notice four tabs that will take you to data not featured as a summary on the main dash. This tab will display information for the domain being researched in regards to the top keyword gains, losses, new ranking keywords, and keywords that fell out of the top ten as far as rankings. The last two tabs from the main dashboard deserve to be broken out into their own section because they're that awesome. 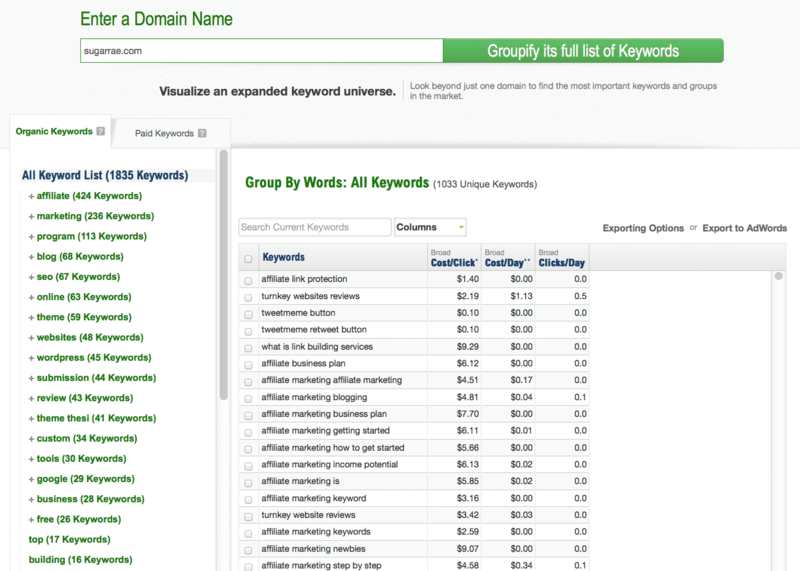 When we think of SpyFu, we typically think of a keyword research tool. 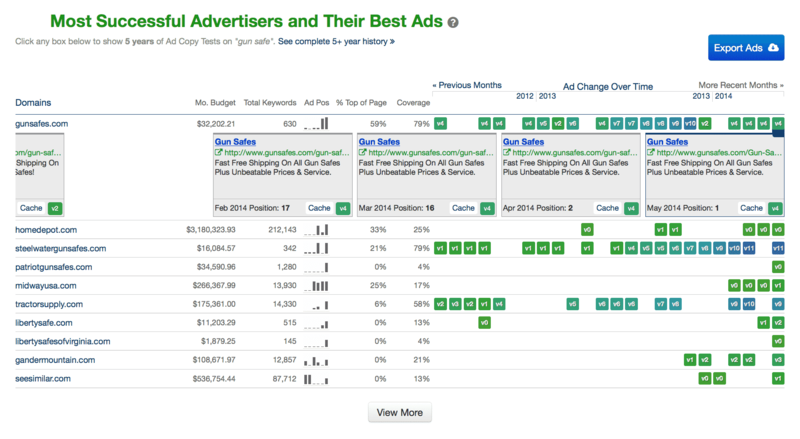 But they have amazing link analysis tools for defining and contacting potential outreach targets as well. This section is pretty cool in that it will show you contact information SpyFu has found associated with the domain you're researching. And not only will it show you lead information for the researched domain, but you can scroll down to see a listing of similar domains and their lead information as well. However, each time you click thru to see the leads information for a site, you are charged a lead credit. The $79 per month plan comes with 280 lead credits. In addition to being able to view leads by typing in specific domains or keywords, if you click the “Leads” tab at the top of the SpyFu homepage, you'll be taken to their “prepackaged leads” section. They have a huge selection of pre-compiled lists. Another cool – and not so known – SpyFu feature. This allows you to do multiple things. First up, you can see a list of external links for the domain you're researching. You can also see a breakdown of the “type” of inbound links coming into the domain. You can also choose to have SpyFu show you a listing of those linking to the researched domain that are NOT linking to a competing (your) website. 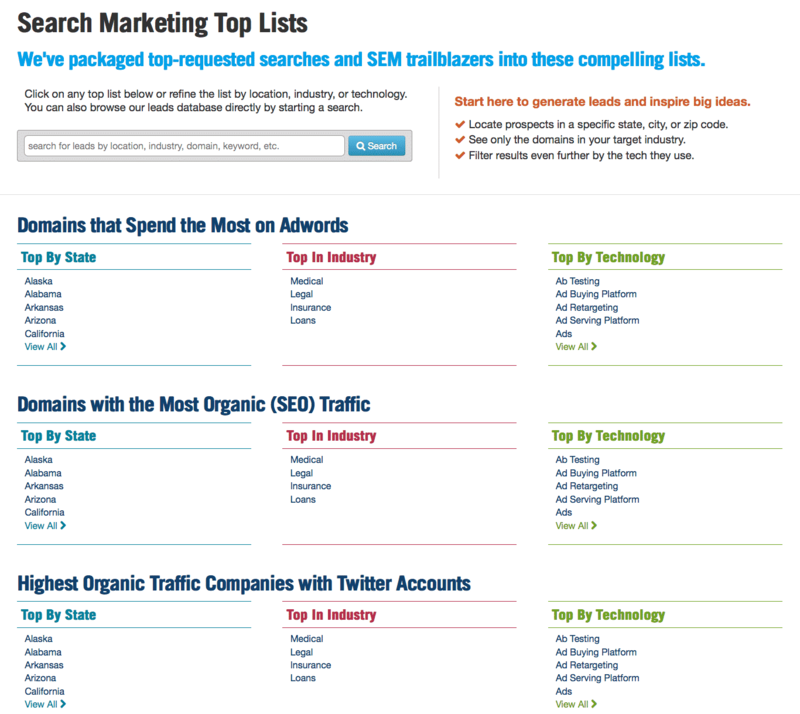 You can also filter the backlinks by keywords they rank on. For example, I instituted a filter for “camo” meaning that SpyFu will only show me the links to basspro.com coming from pages that rank for keywords that contain “camo.” This allows you to seriously drill down to find super relevant and targeted potential link prospects. Another awesome – and little known – awesomesauce of the SpyFu Inbound Links tool is that you can filter who is linking to a domain with direct (not run through a redirect) affiliate links. Let that sink in a little. If you just launched an affiliate program, want to find more affiliates for an existing program or want to find the affiliates of competitors for any other reason, you can simply click the “has affiliate links” box in the left column to sort the links to those linking to the domain with an affiliate link. You can get a list of keywords by either searching a domain (and SpyFu will give you a list of the keywords it believes to be driving traffic to that domain) or by entering in a base keyword. In the example below, I typed in “gun safe” as a keyword to research. SpyFu will display its estimates on total monthly searches for the term, the (estimated by SpyFu) CPC (further broken down into broad, phrase and exact match), the (estimated by SpyFu) cost per day to rank #1 on the term in paid search (further broken down into broad, phrase and exact match), how many advertisers (estimated by SpyFu) there are on the term, the number of homepages ranking in the top 50 for the term, Google's estimated CTR for the term, SpyFu's estimate on the ranking difficulty for the word and a listing of what kinds of results show for the term. And a listing of the current ads being shown for the term. You can drill further down into any of these sections as well. That's a lot of damn data. 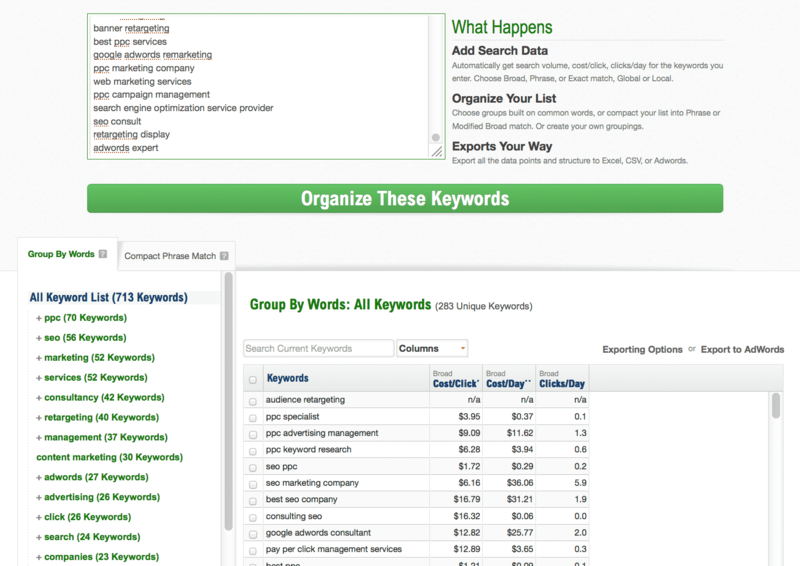 SpyFu also allows you to compare keyword data across three domains. In the graph below, I've compared the Sugarrae domain to Pat Flynn‘s domain and Matthew Woodward‘s domain. There's a lot of overlap in our topics even though I believe we have three very separate audiences though somewhat similar styles. (Note to self, I need to blog more haha). Clicking on any segmented area (in the albeit ugly chart) will give you a list of keywords that meet the specifics you clicked to have shown (in the above, I clicked to show what keywords Sugarrae is ranking for that Pat and Matthew are not). 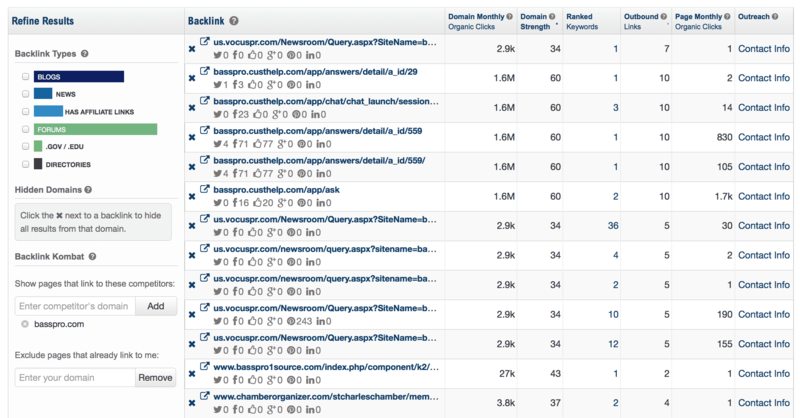 It will also show you a graph showcasing how many keywords each domain has been ranking on over time. This can help you identify sub-topics that your competitors have content on that you can duplicate in regards to developing features or killer content to target those terms (if they're applicable) to expand your reach. This feature is a bit clunky, IMHO. You enter in a domain and keyword to see a site's rankings over time. The below shows the ranking of the Sugarrae.com domain on the term “affiliate marketing” over time. The tool overlays Google updates and some other items on the data, in theory, to make it easy to see if a site was affected by certain updates. I say in theory because it's apparently not kept super updated. If you click the image above, you'll note that Panda 4.0 and Payday Loan 2.0 (parts A & B) are not listed. Which makes me instantaneously not able to trust the overlay data as being accurate. You also can't easily change which keyword your researching for a domain. You can easily add them, but you have to perform an entirely new search to remove one, which is annoying. SpyFu has a rank tracking feature, but you won't be able to track much with their base package. I setup a rank tracking group and was only able to add 400 keywords before the ranking credits included with my plan (200 credits) were maxed. So it looks like every keyword costs half a credit. Additionally, I can't add additional domains to track for the same keywords (to show their ranks side by side on the same screen). 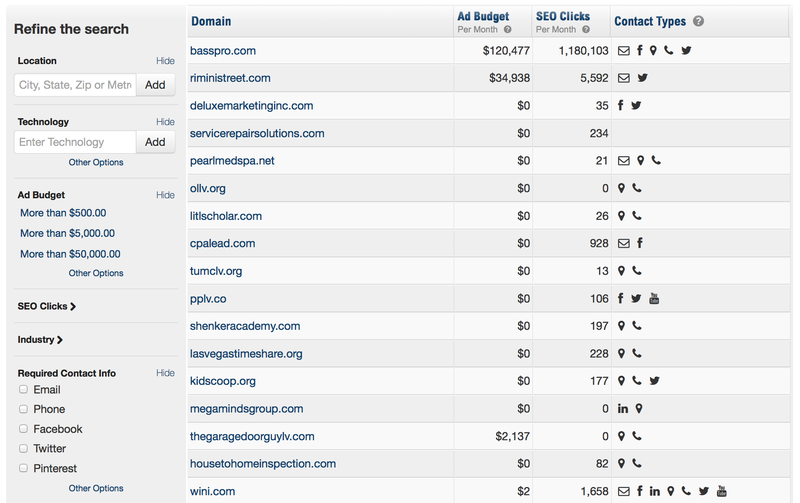 For small businesses and/or bloggers, SpyFu would be an ok rank tracker. Agencies or those who need to track a large volume of keywords are better off with services like Authority Labs. This tool is a little bit (ok a LOT) confusing – especially if you don't do much paid search (because a lot of the commands you can execute are modeled after paid search). The example search SpyFu gave was “low fares +site:cheaptickets.com”. They have a video on the smart search page about the tool, that you would think explains how to use it. But alas, it's simply a very dramatic “THIS TOOL IS FREAKING AWESOME” commercial with screenshots fading in and out with text overlaid proclaiming its power (with 2001 reminiscent shadow behind them). However, if you scroll down, you'll find actual videos that, while again aimed at PPC familiar folks, are somewhat helpful. The gist is that this tool finds the highest performing keywords from PPC campaigns centered around a specific keyword or site. Performing their example search above popped out a keyword list with a lot of data and a lot of awesome sorting functions. But because SpyFu merely assumes we know what that search string refers to and doesn't actually tell us non PPC folks, I'm not really sure what that is a list OF (feel free to pop it in the comments if you do). However, you can use this tool by simply typing in a keyword. Below is a result listing for a search for “seo” as a keyword by itself. From what I've been able to piece together from the videos, this is automatically sorted by “the most valuable keywords”. How that is determined, I don't know. Also, if I click to sort the results by any other column, there is no way to get back to viewing them sorted by “most valuable” – however it is they're determining that. I'm also not sure why filtering the results in the left sidebar to show me searches with 1000 or more broad match results in a day produces a ton of terms listed 0 daily searches. Yes, I get what broad match is, I just don't get how showing me terms with 0 daily searches is helpful to me. In short, I don't use this feature. I got tired of trying to figure it out. I like this tool. You basically dump a list of keywords into it and it does it's best to sort them for you. It's not perfect, but it's pretty decent. I'd assume the primary purpose of this tool is to help you separate keywords to put each in its own ad group in Google. From an SEO perspective, I use this tool to group like keywords so that when I assign a page to a root keyword, I know which other keywords are applicable to the page AND can choose additional keywords to target based on their “perceived value” (by SpyFu) as far as the CPC for those keywords. Keep in mind that while the web-based grid only shows you three columns of info (cost per click, cost per day and clicks per day) if you export the list into a CSV, it gives you a TON of additional data for each keyword (I have no idea why there is no option to see all this data in the web view – thus my comments at the beginning of this post about their UI). I've detailed out how I use the groupie tool to help me estimate the potential ranking values of various keywords and content initiatives before in this post. You can also choose to enter a domain in the groupie tool, and it will do the same grouping outlined above, but with the keywords SpyFu believes is driving traffic to that domain. SpyFu has multiple plans and their pricing can be a little confusing. There is one way to sign up for SpyFu month to month without committing to an annual contract. It will run you $79 per month. If you're willing to commit to (and pay for) a year upfront, then the cost ranges from $599 to $899 per year (depending on if you want US data only or US and UK data) – which equates to about $50 and $75 per month respectively. They also have an agency plan option which comes with five login accounts and white-labeling for about a grand a month. You can get more info about all of the available accounts types at the SpyFu website. So, SpyFu does a LOT. It has (little known) killer link targeting and outreach tools. Finding your competitors affiliates is a really valuable feature if you have an affiliate program. And the groupie tool – combined with the ability to get a cost per day and clicks per day (even if it's a guestimate) – is useful. These are features SEMRush doesn't have. So why do I pay for both? First up, I own an agency. If there's one thing an agency shouldn't skimp on, it's tools. If a tool has a feature unique to a competitor tool that is useful, it will be in my arsenal if it applies to the work I do, even if it duplicates many other competitor features. While SpyFu has a domain vs. domain tool, their maximum you can compare is three domains. With SEMRush, the max is five. 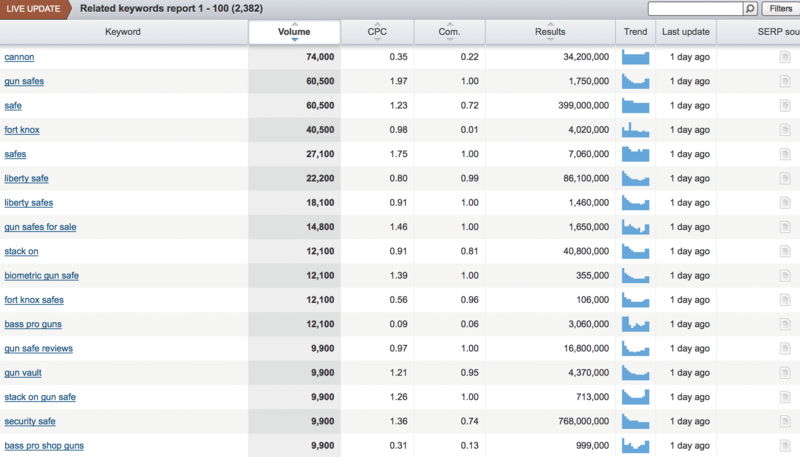 And as superficial as this may sound, SEMRush's charts are much prettier. 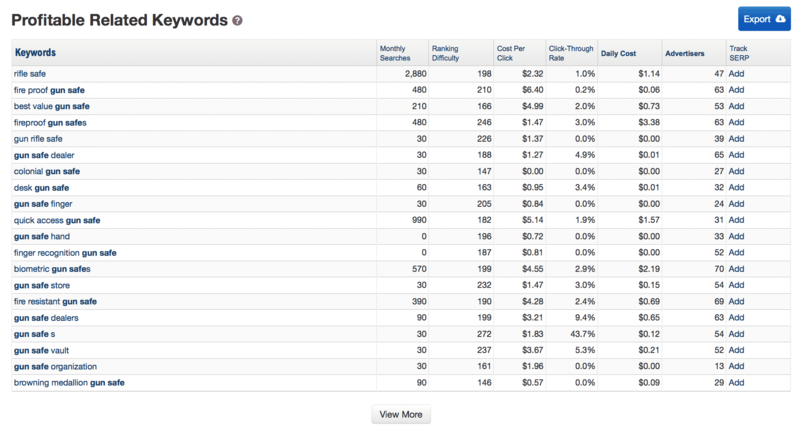 SEMRush also gives a more complete keyword list when it comes to researching a generic keyword. 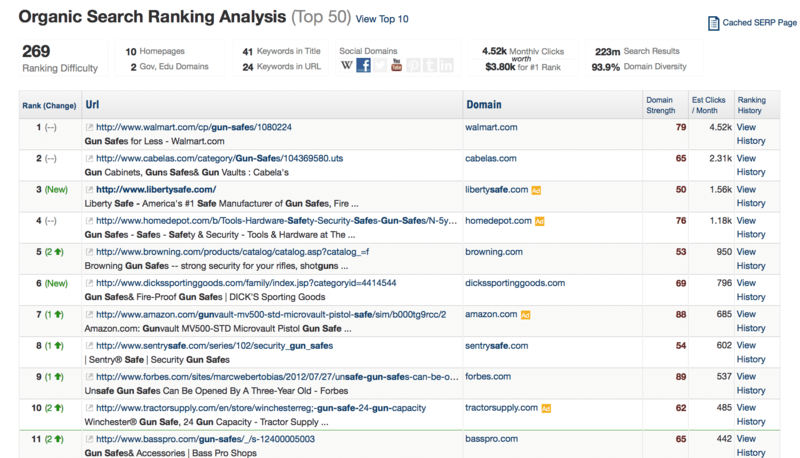 For instance, the gun safe search I did on SpyFu returned a list of “most profitable related keywords.” When you click to view more results, you are presented with one screen of keywords – and all contain the exact phrase “gun safe” within them. SEMRush shows over 1800 results for the same search that include that phrase – plus an entire list of related keywords that may or may not include that exact phrase, but that SEMRush thinks are possibly related. A lot of times I'll research the keywords on SEMRush to compile my list and then toss them into the SpyFu groupie tool to segment, further prune taking into account the cost per day and clicks per day intel. In short, neither is perfect – both have features that when combined, make a powerful arsenal. As an individual, you need to assess the features with both and decide which one most suits your specific needs if you're only going to choose one. That said, SpyFu is a definite “must have” for me. Thank you for reviewing it, Rae. Here at SpyFu we can get caught in this curse of knowledge, and it helps to see things through the eyes of someone using the tools for the first time. You have some solid points, and I think you can look for some functionality improvements that you suggested to hit Ranking History very soon. Adding/changing a keyword will be much easier, and there are some shortcuts we’re building in, too. Your candor is very appreciated. I’m glad that ultimately you consider it a must-have, and we’re working on updates to keep it that way. Hey Sidra – awesome to know re the Ranking History – I’ll look forward to the updates. Also, y’all did a really good job on the Inbound Links tool – really valuable. Hey Rae. Those updates that I mentioned to you are live now. I didn’t want that to slip by without letting you know. Adding keywords/domains in the original search, recent Google updates, trendline, easier start, etc. Thanks! Looks like an interesting tool. 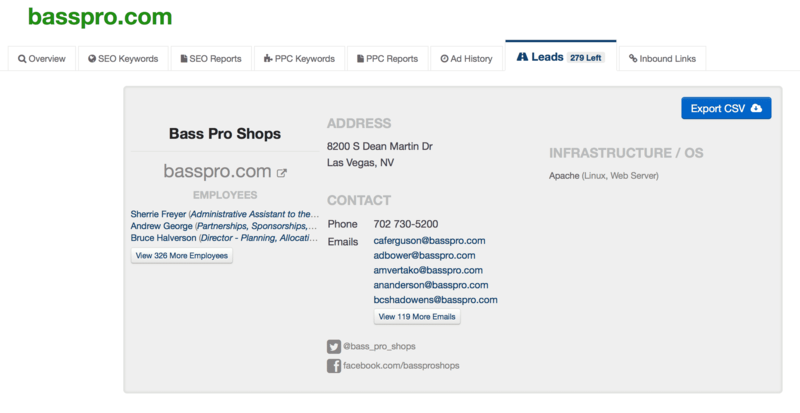 I especially like the ability to gain insight into competitors affiliates etc. Yep, I think it’s definitely one of the more unknown ways you can use it! I’m using SERPstat after I switched from LTP. SEMrush has long been my plan B, albeit it’s pricier. I’ve grown to learn that there’s no way I’m buying a keyword research tool without API.